Two cats have been trapped in sealed buckets and dumped in SoHo. Wale Aliyu reports. At least two cats have been sealed into buckets and abandoned near a Manhattan animal shelter — both of which might have been taken away with the trash if staff hadn’t noticed them, the organization says. 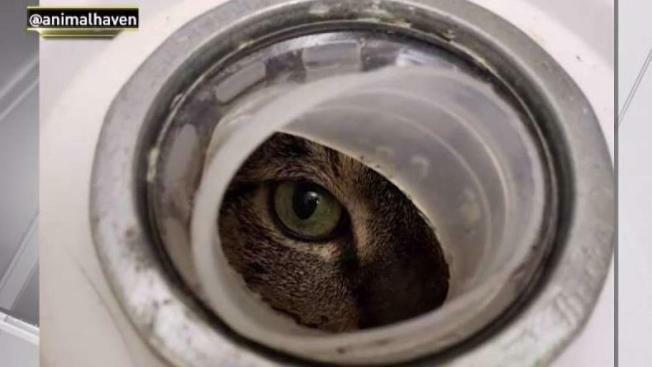 Staff members at Animal Haven Shelter, a SoHo-based nonprofit, were shocked Thursday when staff members found a cat sealed into a bucket that had been placed near a public trash can, the organization said in an Instagram post. Staff found another cat sealed inside a bucket back in November. The pail was placed next to the back door of the shelter's building, Animal Haven said in another post. “Staff isn’t left speechless that often anymore, but when morning kennel went to move what appeared to be just an empty bucket on the side of our building near the back door, they were shocked to see a tiny eye looking back up at them,” the shelter wrote after the first incident in November. “Yes, believe it or not but someone left an innocent cat in a bucket outside our door overnight," the shelter added. The cat abandoned in November, dubbed Sage, was ultimately “safe and sound” and has since been adopted, the shelter said. The cat found last week, however, is “in bad shape and, needless to say, is terrified,” Animal Haven said. SOMEONE DUMPED ANOTHER CAT IN A BUCKET, and we need your help. You may remember when we recently found Sage, a young cat, sealed in a bucket and abandoned outside our shelter. Around 7:45pm yesterday, we found another bucket left next to the public trash can with a cat inside, as if left for garbage. Luckily one of our staff members recognized the bucket, brought it inside and pried it open. This poor kitty is in bad shape and, needless to say, is terrified. We have contacted the police, but we're asking that everyone in the vicinity of our shelter in Soho PLEASE keep your eyes out for any suspicious buckets or containers like the ones in these photos! If anyone recognizes the person in this video, contact us immediately. And if you are ever desperate to surrender an animal, please reach out to us directly. The shelter posted surveillance video to Instagram after the Thursday incident and said it shows a man placing the bucket by the trash before walking off down the sidewalk. The shelter is now asking passersby to keep an eye out for buckets or containers that could contain cats. “We have contacted the police, but we’re asking that everyone in the vicinity of our shelter in SoHo PLEASE keep your eyes out for any suspicious buckets or containers like the ones in these photos!” the shelter wrote. “If anyone recognizes the person in this video, contact us immediately. And if you are ever desperate to surrender an animal, please reach out to us directly,” it added. Police are asking anyone with information to call the NYPD's Crime Stoppers Hotline at 1-800-577-TIPS (8477).